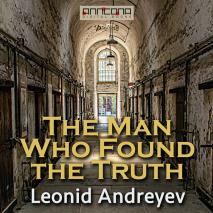 The Man Who Found the Truth is a novel by Russian author Leonid Nikolayevich Andreyev, an acclaimed Russian playwright and writer of short fiction, who was noted for the darkness in his work. An old man, accused of having murdered his family as a young man, spends a lifetime in prison. With brilliant psychological insight so characteristic of Leonid Andreyev's work, we follow this man telling his story about his obsession with truth and lies and his religion of the iron grate, tinged with madness, and not necessarily reliable. . . The Man Who Found the Truth was translated by Herman Bernstein. Total Running Time (TRT): 3 hours, 31 min. Reading by Carolin Kaiser. Leonid Nikolaievich Andreyev (1871-1919) was a Russian playwright, novelist and short-story writer. He is one of the most talented and prolific representatives of the Silver Age period in Russian history. Andreyev's style combines elements of realist, naturalist and symbolist schools in literature.